More than just another colouring page. A first of-its-kind book demystifies the symbolism of pysanky with a rich array of large-format drawings. These can be coloured by children or mounted in classrooms as teaching aids. Kids are fascinated with pysanky and the symbols they can write on a fragile egg. But images in other colouring books or available online are too complicated for children. They need simple designs to balance the skills they need for the technique. In response to the growing interest in Ukrainian Easter eggs and the need for teaching aids, this book was created to complement other resources used by educators. Select this link to watch a Pysanka Power Video Clip that flips through the pages of My First Pysanka - Symbols my Baba taught me, one of the many childrens books available from Babas Beeswax. See the book format, pages, colourful cover, and contents of pysanka designs featured in this book. Select this link to listen to an interview of Joan Brander by radio producer/host Pawlina on August 26, 2018. Joan Brander draws on not only her Ukrainian culture and heritage but also her experience promoting pysanky to teachers and children. She shares traditional pysanky symbols that were passed down through the generations learned as a child from her grandmother whom she called "Baba". She has partnered with teachers and schools since 1991 by giving workshops and demonstrations to kids of all ages and levels of experience. Her range of publications and teaching aids include a bibliography, children's activity book, videos, powerpoint, pamphlets, newsletter, and eBooks. A new children's book has been on my mind for some time now. With Pysanky on Paper : An Activity Book for Children going into its fourth printing, I knew that my readers needed new content. A fan of my teaching aids in the United States phoned me to ask if I had any of the large format pysanky symbols that she saw in many of my videos shot in my studio available for use. The light bulb went on, we had a chat, and she encouraged me to publish a book of large-format symbols. What surprised you the most as you researched it? I was surprised, that despite the many symbols I found on GOOGLE, none were age-appropriate. By that I mean most were complicated or elaborate patterns, or images of pysanky with multiple motifs. Even when I printed copies for my own research, the resolution was so low that it was unuseable as a learning tool. Other than Pysanky on Paper : An Activity Book for Children that was published back in 1997, there was nothing that existed that replicated what I had in mind. As seasoned readers thumb through the pages they will ask "where have you been all my life?" 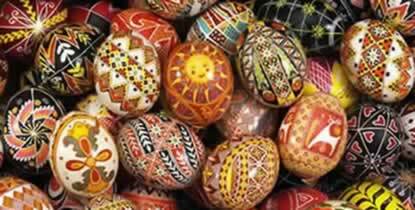 while novices to pysanky will be surprised that the symbols are abstract representations. What's the most valuable lesson or message readers will get from it? Learning pysanky is easy, fun and affordable. Even starting as a toddler, a child can see the symbols on paper, recognize some familiar motifs, and see some that are unfamiliar, and even the act of using crayons, the beginnings of pysanky is being impressed. But the book is useful for all ages, and especially as a teaching aid in schools or wherever pysanky is being taught. Yes, I'd have to say that the book has enhanced my life, as not only is it another genre to add to my list of titles, but it targets my favourite audiencechildren. I'm fascinated working with children, who aren't as afraid as adults to try something new and different. Given the proper instruction and tools, they too, can create beautiful pysanky. When they're frustrated by their first squiggly lines of beeswax I say "this will be the most beautiful pysanka you've ever made" and with that encouragement they'll smile and persevere. Of course it's not until you reach the end of the process of pysanky that the magic really happens. I hope that My First Pysanka: Symbols my Baba taught me will instill a curiosity to learn more about pysanky. With so many patterns to choose from, how did you decide which ones to include? First and foremost I wanted to keep the designs simple and age-appropriate. Reading up on pysanky symbolism categories that came up were "scevomorphic", "phytomorphic", "zoomorphic" and "cosmomorphic"! I don't even know what some of these mean. Nor did my baba use any of these words when she taught me. So the age-appropriate categories I included are plant, animal and shapes. This colouring book was a bit of a departure from my usual writing style, but I've got a couple more ideas for eBooks and graphic designs for the internet. Just waiting for the spark to ignite. Where can children learn more about pysanky? Start with one of my workshops in my studio or in the community, or learn from Baba's Beginner's Kits available from this website BabasBeeswax.com.